The only pasta that I eat are Spaghetti and Carbonara. I don't find pasta with less sauce attractive for my taste buds. But when my friend Tracy, introduced me to Chorizo Pamplona Pasta, I fell in love! And I'm going to share with you the recipe of this quick and easy-to-cook pasta that you will definitely like. Cook pasta according to package instructions, set aside. Sauté garlic, onion and tomato until caramelized. Add Chorizo Pamplona, salt, and pepper; cook for 5-minutes before adding Dried Basil Leaves. Mix the pasta together with the cooked Chorizo Pamplona. Top it with grated cheddar cheese and ENJOY! 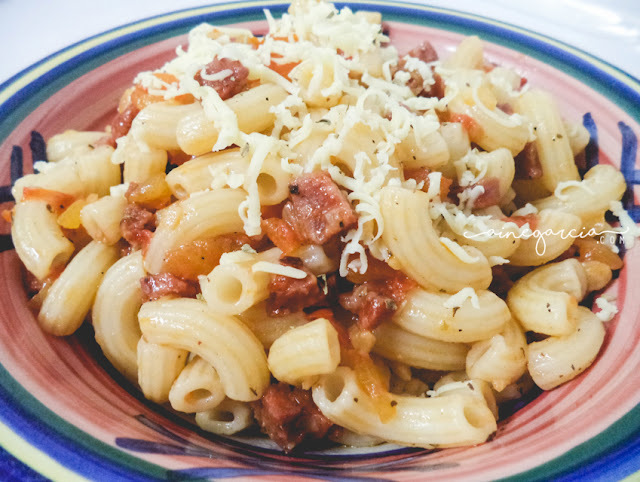 This recipe is good for 3-4 person and the ingredients for this recipe costs below Php100. Just in case you're wondering, Chorizo Pamplona is made up pork, beef, salt, pepper, and spices. It almost had the same taste with Salami, THAT IS according to my taste buds.